Reflecting on recent events in Europe, Professor Zaslaw has kindly forwarded these thoughts, which first appeared in a Festschrift for Professor Ebisawa Bin on his 80th birthday (Tokyo, 2011). On Monday, 24 December 2007, the New York Times published a cleverly crafted essay on its op-ed page wherein its author, Slavoj Žižek, the Slovenian philosopher who is international director of the Birkbeck Institute for the Humanities, University of London, and author of innumerable books, films and articles about ... almost everything, undertook a fashionably Po-Mo critique of the finale of Beethoven Ninth Symphony. He purports to show that much that was devious and evil in European civilization—cultural hegemony, colonialism, and racism, to name a few—is encapsulated there. Anything? Like any cultural icon “The Ode to Joy” can, and has, stood for many things to given persons at given times and places. With all due respect to semiotic theory, however, this cannot logically be made to mean that it stood or stands for “anything”—or for that matter for a nihilistic “nothing.” One ought, perhaps, to be suspicious of any argument that retreats to an abstraction when it reaches its crux. Žižek’s abuse of historiographical logic troubles me. Wishing to make a political point about the European Union’s inability to deal with Turkey’s application to become a member, and having proven to his own satisfaction that Beethoven’s Ninth Symphony is an “empty signifier,” Slavoj Žižek has filled this imagined emptiness with nonsense largely of his own manufacture. True, the Nazis co-opted the Ninth for their nefarious purposes, but it is just as true that Leonard Bernstein conducted it in Berlin to celebrate the tearing down of the Wall. And the Ninth is indeed a cult piece in Japan, with annual performances in many large and small cities and at the opening of the Diet. It is not true, however, that the Ninth, or even its finale, is the anthem of the EU. The EU’s anthem is solely the unadorned hymn-like tune upon which Beethoven constructed his finale, stripped of the poet’s verses and the composer’s elaborations. To this tune each member-country attaches newly written verses in its own language. Yes, the Ninth has had an extraordinarily varied reception history, some of it deeply troubling. But Žižek distorts what the inclusion of “Turkish” music meant to Beethoven and his audiences. Viennese composers of the late-eighteenth and early nineteenth centuries—Gluck, Haydn, Mozart, Beethoven among them—had few options when it came to representing the non-Christian world beyond Europe. Traders, colonists, and tourists had long carried reports and physical objects back to Europe. Music in unfamiliar styles was less easily transported. In such a context, imitations of Spanish dances (the Fandango in Gluck’s Don Juan and Mozart’s Marriage of Figaro) or of naturalized Gypsy melodies from eastern Europe (Haydn's “Gypsy” rondo) passed for exotic. And then there is the so-called “Turkish” music. Austrian soldiers had heard the Janissarys in battle, and a Turkish crescent or “Jingling Johnny” captured from an Ottoman military band was considered a prize trophy. During times of peace the Turkish ambassador in Vienna sometimes maintained a Janissary band. 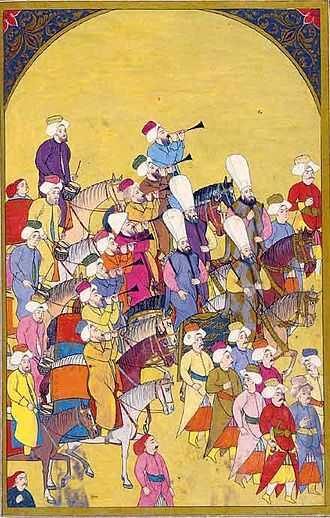 Austrian composers created their own simulacrum of Janissary music, acculturated in ways that their performers could cope with and their audiences grasp—most often swirling melody accompanied homophonically, minor key, march tempo, static harmony, rhythmical bass line, and the addition to the then-customary orchestral forces of a piccolo or penny-whistle, jangling triangle or cymbals, and a side drum. Of course Beethoven’s symphony was meant to entertain, to edify, to move its listeners. And of course his handling of Schiller’s Eurocentric attempt at universalism was emblematic of the ambivalent relations between adjacent, mutually uncomprehending cultures. More importantly, however, it was an attempt at a kind of thought-experiment, at stay-at-home anthropology, at imagining oneself outside of European culture in order to critique it. This is clear, for instance, in Mozart’s “Turkish” opera, The Abduction from the Harem, in which the denouement reveals a Moslem prince to be more magnanimous than his Christian counterpart. Gladly, like a hero to victory. In our despair over the present state of the world, we may find it all too easy to project our feelings of anomie onto iconic targets. The history of the two centuries that have succeeded Beethoven’s (and Schiller’s) wishful, naive utopianism qualifies the “Ode to Joy” as such a target. But misrepresenting the past in a ploy to score points in the present is dishonestly self-serving. Lewis Carroll had apparently met some Victorian Žižeks: “‘When I use a word,’ Humpty Dumpty said in rather a scornful tone, ‘it means just what I choose it to mean-neither more nor less.’” The signifier is empty only to those who choose to regard it as such. Neal Zaslaw is Herbert Gussman Professor of Music at Cornell University. Zaslaw's numerous and influential books and articles on performance practice, and on Mozart and his music, have shaped the way a generation of scholars and music lovers understand this foundational figure, in this country and around the world. He is editor of the revised Köchel catalogue, forthcoming. Thank you, Neal, for your correction to Zizek's misreading of the "Turkish" idiom in the Ninth Symphony! Hmm. Not sure about this. It almost seems that you're saying "Zizek is wrong to think the Ode to Joy is bad; actually it's good! "—for "bad" substitute "racist" or "empty" or whatever. Looks to me as if Zizek has nothing but admiration for Beethoven—he even lovingly implies Ludwig van was doing precisely the same thing he likes to do ("critique of ideology", albeit in "musical form") https://www.youtube.com/watch?v=XM9erS90gTE Zizek's "empty signifier" is the malleability of the piece—i.e. that the melody has been admired and used by pretty much every different part of the political spectrum. The piece's profundity is not expressly political as non-specific, amorphous, hence malleable. (Compare, say, to the Cantata on the Death of Emperor Joseph.) He doesn't think the piece "shallow" by any means. Zizek takes the second section of the OtJ as a representation of the Other—that which escapes encapsulation in the official societal ideology, but whose exclusion rather defines, and perhaps revivifies through overcoming, that same ideology (i.e. in the chorus following the fugue). While one might beat around bushes about whether the music is sufficiently "turkish" or not, the fact remains that the contrast between the fermata on "Gott" and the contrabassoon "flatulence" that follows could not be more marked. Zizek is right to call this section carnivalesque. Its imagined Other is practically the ship of fools. If one wanted to properly critique Zizek, it would be to say that the analysis is incomplete. (I'm not sure if there's a fuller, more extended thought in a book somewhere. Probably there is.) In other words that the "slow movement" that follows the "scherzo-marcia" is where much of the metaphysics of the piece resides. I don't think it's enough to just quote the Schiller and have done with it. If the piece is trying to lay anything out, schematically, in these sections—i.e. establishment vs. lumpen or excluded others—then what of the highly theological music (labelled "divoto"! ), emphasis all on "magic", the presence of God, "loving Fathers" that follows? Humanity "knowing its creator"? If the piece is about the whole of humanity, one might suggest that it begins with humanity's Ego, moves to its Id before alighting on Superego. Is the final, fugal fourth section sufficiently conciliatory with all these different aspects of humanity? Do the final dionysiac outbursts in the prestissimo signify humans as a noble or ignoble creature? Is there not a note of despair in the repeated hammering Beethoven offers us? Incidentally, the remark about "misrepresenting the past in a ploy to score points in the present"—this seems a little rich. I'm not here to defend Zizek's historical musicology—he's no historian; he's a journalist-philosophe—but the idea that an interpretation of an artwork is a "misrepresentation" of the same is dubious. There wasn't even a single critical representation of the piece _when it was performed_. And seeing as it isn't 1824 any more, what, exactly, are we to hold to be the "correct representation" of the OtJ? "The Ode to Joy is about _all of humanity_, buster. End of."